Hosted and organized by the Institute for Society and Genetics. How do we age? Why do we age? Can we extend life greatly, or indefinitely? Scientists approach aging as a biological fact, or a technical problem to be solved; artists approach it as something moral and aesthetic, or as a crucial or inevitable dimension of society. Both disciplines are concerned with the genetic inputs for and the physical manifestation of aging. Here we plumb the intersection of biological science and artistic production to explore the “Art of Aging”– including both the artistic and scientific representations of growing older, and the process of adapting gracefully to aging as individuals and as a society. The two-day symposium pursues our questions with a Friday evening (May 11) panel bringing leading scientists, artists, and historians together in discussion, and a Saturday (May 12) festival where attendees can explore over a dozen interactive artworks, presentations, and exhibits. 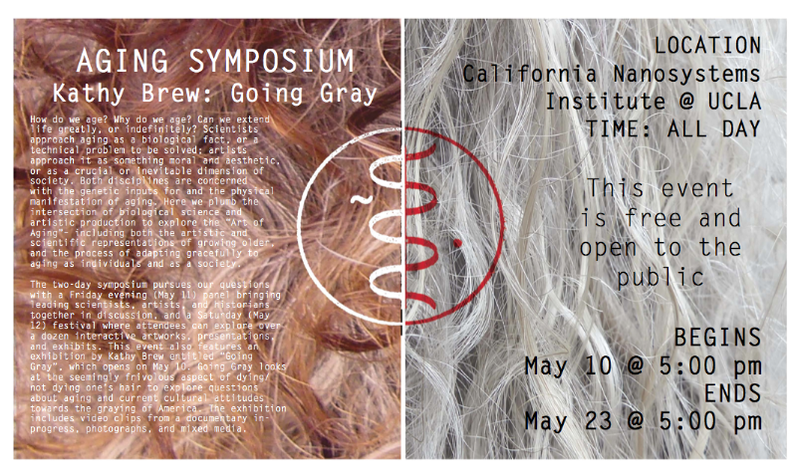 This event also features an exhibition by Kathy Brew entitled "Going Gray", which opens on May 10. Going Gray looks at the seemingly frivolous aspect of dying/not dying one’s hair to explore questions about aging and current cultural attitudes towards the graying of America. The exhibition includes video clips from a documentary in-progress, photographs, and mixed media. This event is free and open to the public. For more information and to register, please click here.